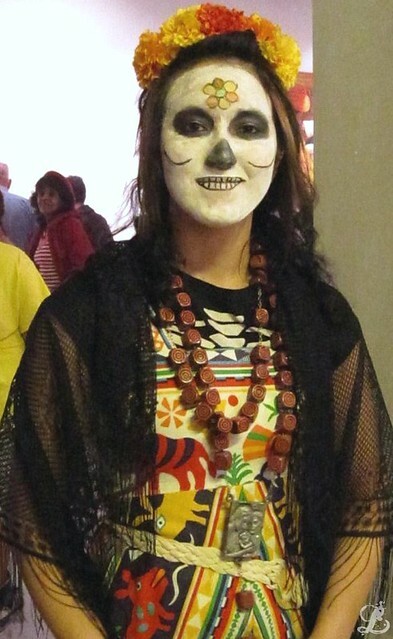 In thinking about this second post on Dia de los Muertos is occurred to me you may not be familiar with the holiday, I will share how it became important to me in the next post but first a little history. 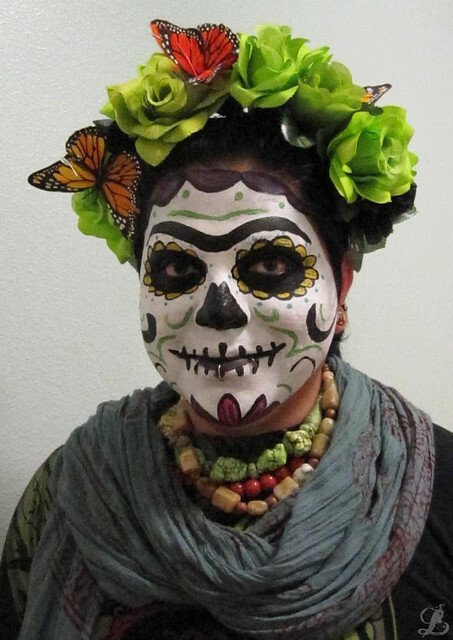 Dia de los Muertos is celebrated on the first and second of November and even though the are Catholic holidays as well, this is actually an indigenous Mexican holiday. It is believed that on the first the souls of children are allowed to return to be with their families for the day and on the second day the souls of the adults return. The alters are filled with food and gifts for the weary travelers, as well as remembrances from their lives. 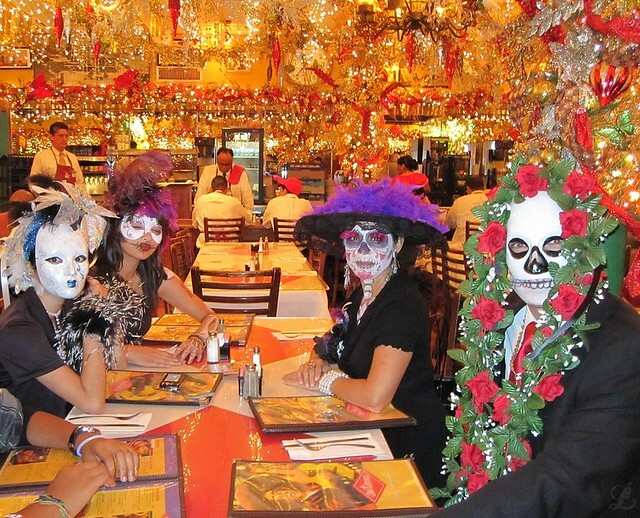 Often times we now see the Sugar Skulls as decoration but it is actually one of the traditional foods as well. Sugar art was brought to Mexico by the Italians Missionaries and it is and inexpensive way to make beautiful decorations. So the sugar was molded into a skull which was then decorated with colorful icing and then had the ancestors name written on it and it was presented as an edible offering. 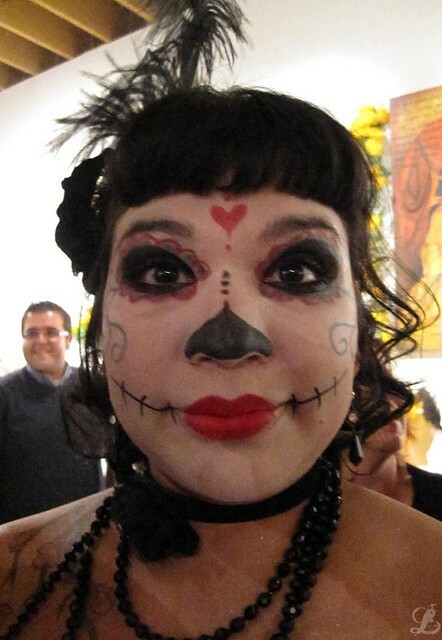 Today we see Sugar Skulls in much of the Dia de los Muertos artwork but I always have a special place in my heart for the people who adorn themselves as Sugar Skulls as a make-up artist I have a pro-found respect for a project that takes that much time and dedication to symmetry. So I share with you some of the unique individuals I photographed. This girl managed to captured her youth while also masking her face, her simplicity paired with the traditional jewelery and accessories convey an interesting sense of innocence. I love when men dress for the holiday, I guess it is because I think that we as girls naturally want to play dress up so I always think it is very cool when a guy goes the extra mile too. 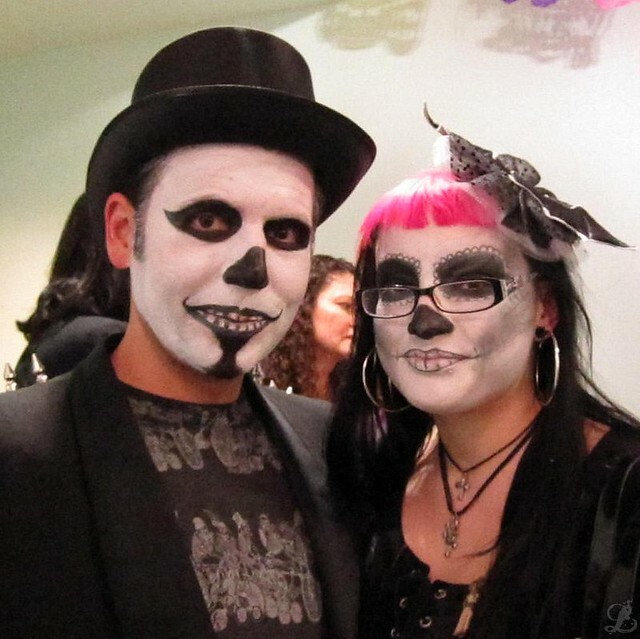 This couple looked incredible; their attire was entirely black and white except for the pink in her bangs, it really gave them their own very distinct look. I really thought the top hat was a nice touch too. 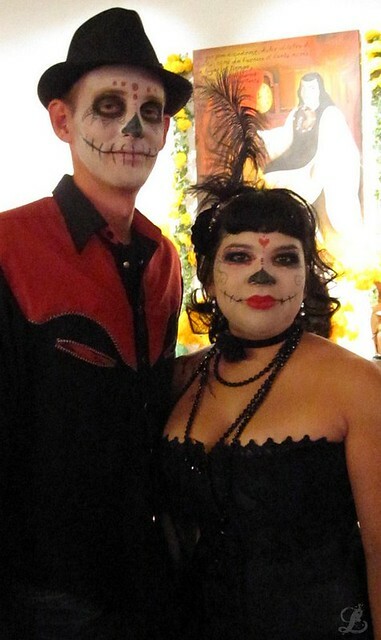 This couple looked awesome as well, they stayed with reds and blacks; I really like that she integrated her color choices with the make-up. I really like her costume and jewelery, I thought it was flapperesque. I had to get a close up of her face because I loved her attention to swirly detail. I liked that she drew the upside down heart as the nose but also that she connected it to the one on her forehead, the whole look was very girly and cute. I deemed this guy the fairest of them all because his work was just amazing, I love that he chose to work with greens and that he painted the flower on his chin, the over all look gave him quite a mystic presence. This next shot was my lucky shot; I was actually eating dinner at an old and well known Mexican Restaurant when these people walked in. I thought they all looked amazing, each of them had a very distinctive yet very defined look. This particular restaurant has Christmas lights hung it in it year ’round, those and the wait staff created the perfect background for this picture. It is my favorite and I call it Mi Tierra not only because of it is the name of the restaurant but because I embrace the connotations of the words Mi Tierra; it is my land, my home and my culture. This entry was posted on November 17, 2010 by LahainaLaura. It was filed under San Antonio .